372 days. That’s the last time that New York City FC won on an FS1 broadcast – and what better way to end the curse than a win against their Orlando City SC rivals? After a disappointing midweek loss to Real Salt Lake, New York City FC grabbed all three points in what is easily the biggest win of the season thus far, ending Orlando’s unbeaten run at home in the process. The Boys In Blue looked confident, hungry, and motivated from the get-go, looking to avenge the two losses they suffered to Orlando this season and right the ship from their last loss at RSL. They did just that after Orlando City conceded a penalty call when Kaká was punished for a hand ball in the box. Who else would step up to the task but reigning MLS MVP, David Villa? Joe Bendik guessed correctly to his left, but to no avail, as Villa put it just out of reach. 1-0 to the visitors. Orlando created a few chances in the first half through Carlos Rivas and Cyle Larin interplay, but nothing that posed much of a threat on Sean Johnson’s goal. Ethan White went down in the 26’ with what looked to be like cramps, but he stayed on just long enough to extend the lead. After an impressive passing sequence that’d surely make Patrick Vieira happy, NYCFC scored its second goal as Ethan White received the ball after an overlapping run on the right side, then delivering an accurate low cross to Rodney Wallace who had an easy tap-in on the back post. White was substituted for R.J. Allen immediately after the goal. NYCFC went into halftime with a comfortable 2-0 lead, controlling the flow of the game and looking very comfortable in possession. Orlando struggled to cope with the high press of NYCFC, particularly Rodney Wallace, Maxi Moralez, and David Villa. Orlando started the second half strong, forcing New York City into errors with their own high press and put some pressure on the NYCFC backline. Kaká, Orlando City’s superstar designated player, struggled to get into the flow of the game and uncharacteristically misplayed passes on various occasions. The Brazilian was subbed off in the 59’ and would have loved to stay on a just a few more minutes, as Orlando earned a penalty after Scott Sutter was taken down in the box by Ben Sweat. Cyle Larin, NYCFC’s nemesis, stepped up to the penalty spot and, fortunately for the visitors, fired a powerful shot that went right off the post. NYCFC wasn’t content to just sit back and see out the game, as they pushed forward looking to create more opportunities as Orlando City opened up. Jack Harrison came close to scoring after his patented Jack Harrison Special: the “fancy step-overs, cut inside to the left and fire a curler.” Bendik did well to make the diving save. NYCFC ultimately went on to score their third through none other than Villa. The Spaniard was played through on goal from Moralez with a perfectly lofted ball, taking advantage of Orlando’s very high line. Villa dribbled around the goalkeeper with grace, put the ball in the back of the net and sealed a massive three points for the visitors. Who else but David Villa? The captain led by example, pressing Orlando’s backline and goalkeeper throughout the match and making no mistake of the opportunities he was given. 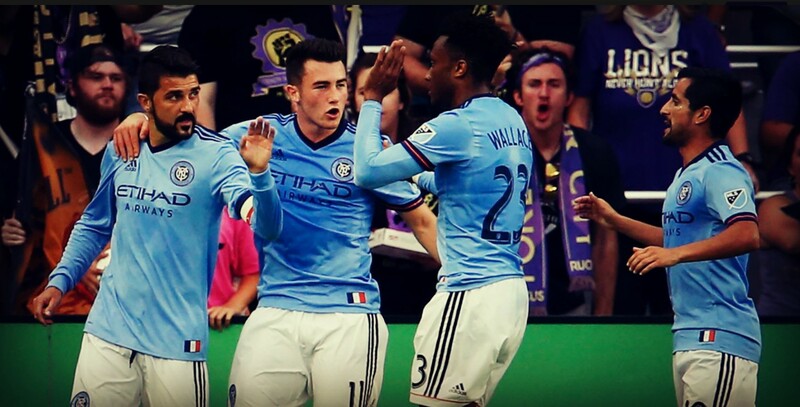 Villa played a role in all three goals for NYCFC, picking up a brace in the process. He played well in between the lines, found the ball in pockets of space and put in a shift defensively. It was a spectacular performance by the captain, in a much needed game against our rivals. Big players step up in big games, and that’s exactly what Villa did tonight. New York City FC will look to cap off its long road trip next Sunday in Atlanta, as they’re set to face Atlanta United FC at Bobby Dodd Stadium. 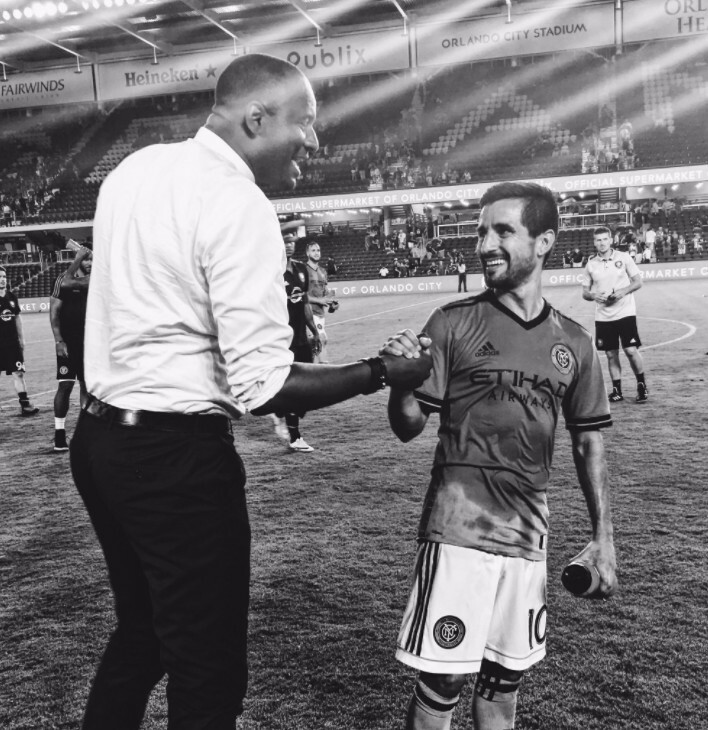 Atlanta United is coming off an impressive 4-1 win against the Houston Dynamo, and will be fired up from their visit to Yankee Stadium earlier this month when they lost 3-1 to NYCFC. Villa, Moralez and Wallace all chipped in with a goal on that afternoon.